The bakery at the centre of the “gay cake” case has confirmed it will not seek legal costs from the Equality Commission for Northern Ireland. The UK Supreme Court unanimously ruled last year that Ashers Bakery Company’s refusal to supply a cake iced with the message ‘Support Gay Marriage’ was not discriminatory on the grounds of sexual orientation, as the refusal was based on the message and not to any particular person. 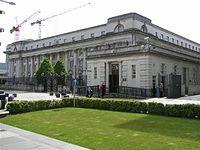 Ashers were financially supported during the case by the Christian Institute (CI), whose director Colin Hart said he did not want to set “an unhelpful precedent in relation to costs”. The Institute has previously argued that cases with a “wider public interest” should see each side pay their own costs. Mr Hart said it was “important to Ashers and to us that the approach to costs now is consistent with what was previously argued”. The Equality Commission’s total costs in relation to the case were £250,603.